28 members attended our February meeting when Stacey Belbin gave us a talk on “Lady Grace”. Her dad was a commercial fisherman and ever since she can remember she helped her dad clean and mend nets and catch fish. When she left school she worked for a Bank. Her life was all about her career until she met her husband, then she realised life is for living and not for working all the time. She met Scott at 18, his dad had brought him up in the angling world and hers had brought her up in the netting world. On their first date, Scott took her angling and since then, her dad lost his crew and they decided to buy their own boat, “Galloper”, to take people angling at weekends. They both had their day jobs, Scott as a carpenter and Stacey in the bank, but they used to spend weekends running the fishing trips. As the business grew she decided it was time to get her own toy to play with. In March 2011 they bought “Lady Grace”, it took until the end of August to get her ship-shape for passengers and then she ran her at weekends and continued her weekday job. 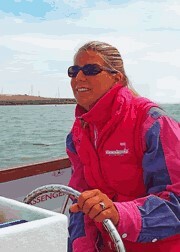 In 2012 she then worked “Lady Grace” during the May and October half terms and the full 6 weeks school holidays. 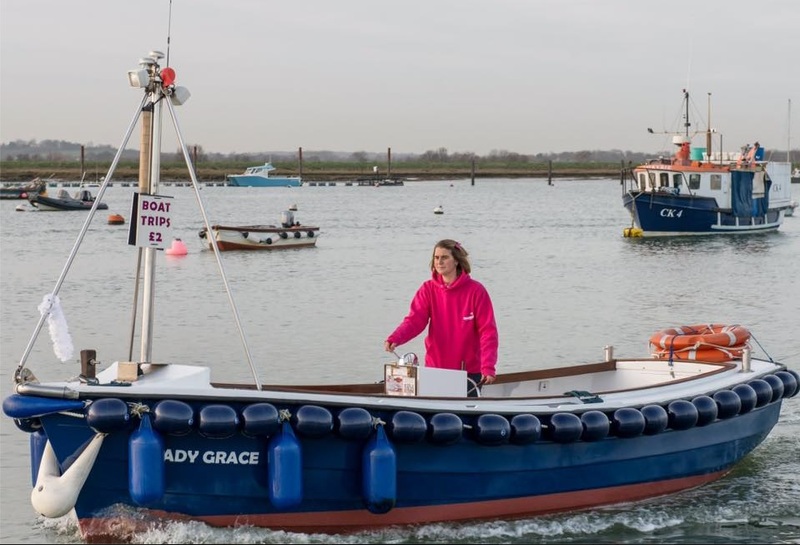 After running “Lady Grace” for 6 weeks solid during the school holidays, in January 2013 she made the decision to give up the day job from the April and run Lady Grace 7 days a week 364 days a year. The first year was testing, but rewarding. Stacey loves working on “Lady Grace”, which was evident by her passionate talk, and every day and every trip being a different one, meeting different people and a forever changing scenery with the tide coming in or going out and the different birdlife visiting through the year. She is also a photographer of all things beautiful on the water, whether it be a landscape, sunrise, sunset or wildlife. You can follow Stacey and “Lady Grace” on Facebook. 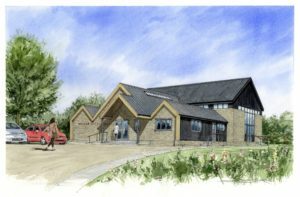 Our next meeting is on the 22nd March and is our AGM and therefore a closed meeting. However visitors are welcome afterwards from 8.00pm, for a Quiz and Nibbles, at a cost of £5.00. Details of all our meetings and speakers can be found on the diary of the home page of the Winstred 100 website. If you would like further information about P.A.W.S please ring either of the following committee members: Alice Holmes 01206 735510 or Jane Anderson 01206 735505. There was no meeting in December but instead on Tuesday 10th December 42 members met at the Coast Inn, West Mersea for the PAWS Christmas dinner, which certainly was a lovely way to set off the Christmas festivities. The restaurant was decorated for Christmas and very welcoming. Between eating our three course meal, we had a Christmas quiz and a raffle, which everyone enjoyed, in fact, they all agreed that it had been a fantastic evening. Going home was a little slow as there was very thick fog but thankfully we all did so safely. Happy New Year to all our members and loyal visitors. Our next get together is on 14th January when our speaker J. Lilley is the “Storyteller”. Currently membership is closed but visitors are very welcome at the cost of £3.50 which includes refreshments. Details of all our meetings and speakers can be found on the diary of the home page of the Winstred 100 website. If you would like any further information about P.A.W.S. please ring one of the following committee members: Alice Holmes 01206 735510, Jane Banks 01206 7354004 or Jane Anderson 01206 735505.